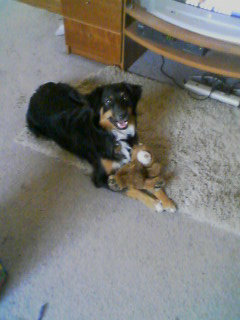 Who is Our Awesome Aussie... Harvey who we adopted from the no kill shelter in Phoenix, AZ 3 years ago. He was 7 months old when we found him at shelter and he was literal climbing the walls. He had been there 3 months and was at the dog pound before that. We looked around a bit and ended up at the hyper dogs kennel again... my question to the family is are we ready and willing this one is going to be a handful and then some we were soon to find out. Come to find out there was a language barrier, he knew spanish and we spoke english. I took the lead on training since I was the first one home in the afternnon so everyday from 1 to 5:30 my first step was to get him to trust me. And as soon as he knew I wasn't going to hurt him emerged this smart wonderful dog who someone had had abused. He has taught me to have patiences soon he was swimming, sitting, jumping, running, fetching and loving, rolling over. He is the best dog ever! I couldn't imagine our lives without him. Spoiled but well deserving and worth every bit of it. Harvey is the best...after all this time.